Ambiente Blog • New colours are natural winners. Green rolling hills, crystal blue water and yellow primroses. These colours all artfully lend a natural freshness to home accessories, crockery and kitchen utensils. Last year’s candy colours have made way for stronger shades that instantly open up all the senses and usher in a light, bright mood. Our examples from colour specialist Pantone are a teasing taster of summer. And how about a hotel tip to tickle your fancy? No other colour than fresh green is more stimulating to take a deep breath and recharge the batteries. All shades of green reflect the power of the plant world: that must be why we’re so entranced by it. While nature itself takes care of the palette outdoors, we bring some ‘Greenery’ indoors as the trend colour of 2017. A vital grass-green mixture of cool blue and shimmering yellow tones soothes the eyes and boosts the mood. It makes an appearance in almost every area of life this year – in fashion, beauty (nail varnish) and interiors. Even a little hint of freshness like a green designer lamp above the dining table brings a warm smile into everyday life. Green also means ‘go’ when it comes to jewellery and handbags, as witnessed by the latest collections from the top labels. 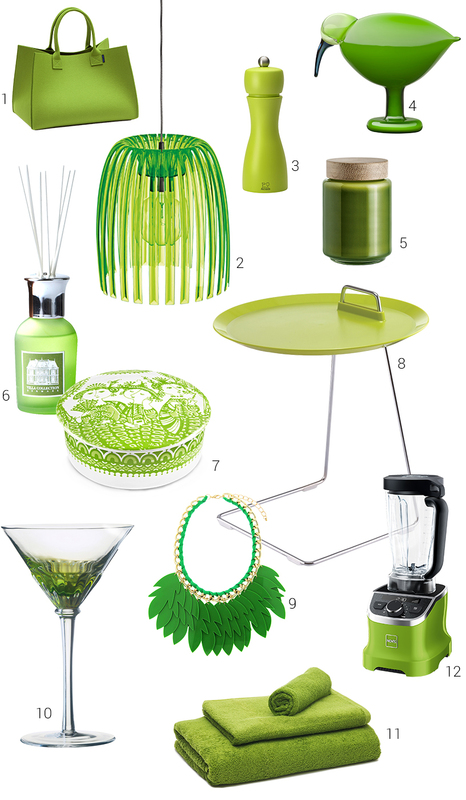 It would be simplistic to attribute all this new colour craze to the ‘urban jungle’ trend and the popularity of green lifestyles, with their Matcha tea and avocado. The truth lies somewhere deeper within us: green symbolises a growing need for rejuvenation and new life, to get back to nature and closer to one another. This is a colour that always gives out positive signals and adds beauty to our everyday lives. The range of greens is extensive, and lighter and darker shades go beautifully together. Combinations with dark turquoise or deep black can give the 2017 trend colour an elegant twist. It’s rush hour in nature right now, life is pulsing with competing colours and yellow shows off with particular enthusiasm. The trend for ‘Primrose Yellow’ embodies the springtime phenomenon like no other. This warm shade, inspired by spring meadows, radiates pure joy and enough energy to brighten any rainy day. How so? 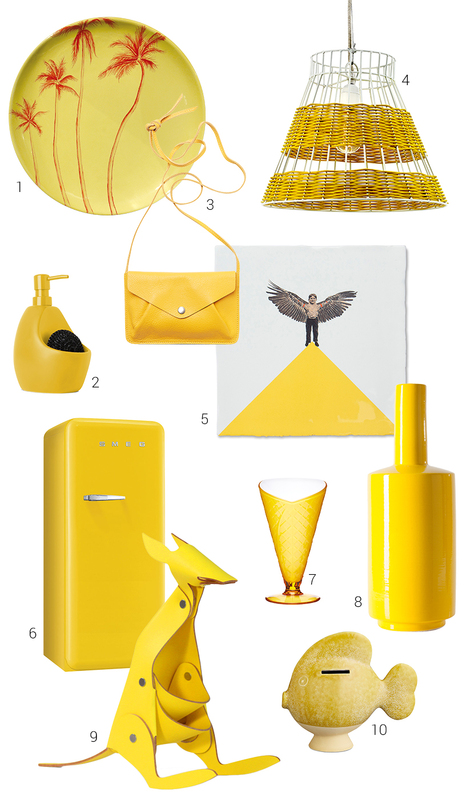 Just sprinkle a few yellow statement pieces where sparkle is needed most. Perhaps a vase that shines even without any flowers in, or an animal-style origami desk tidy? Plus, who says a fridge must be white or silver – even if your kitchen’s really low-key, a sunny yellow giant of a fridge will bring some retro rock ‘n’ roll into it. Yellow is naturally very open and welcoming, and it makes us optimistic. Take care not to overdose: the best rule of thumb is ‘the brighter the yellow, the stronger the signal it sends’. But to be honest, what would a modern interior be without soloists who know how brilliant they are? Modest understatement is not what yellow’s about, and that’s why we fall for its charm. It doesn’t take much effort to add some yellow spots and bring our homes into full bloom. A ray of warm sunshine lights the room, and even on walls provides welcome refreshment. The pairings are also important – yellow can accentuate an ensemble, perhaps with some light wood drawing attention to ochre and green. Yellow also contrasts brilliantly with black or blue. “Blue is dominant, controlling, alive. Blue has no dimensions.” said the painter Yves Klein, renowned as a champion of ultra-blue art. And we reckon he has a point. Blue brings with it a sense of breadth in a straightforward style. Blue bears authority among colours, with the merest hint of blue providing reassurance and harmony. Pantone’s Niagara Blue could have been made specifically for our current, growing need for harmony: a classic denim shade that fits fantastically well with the fashion for a toned-down colour concept. 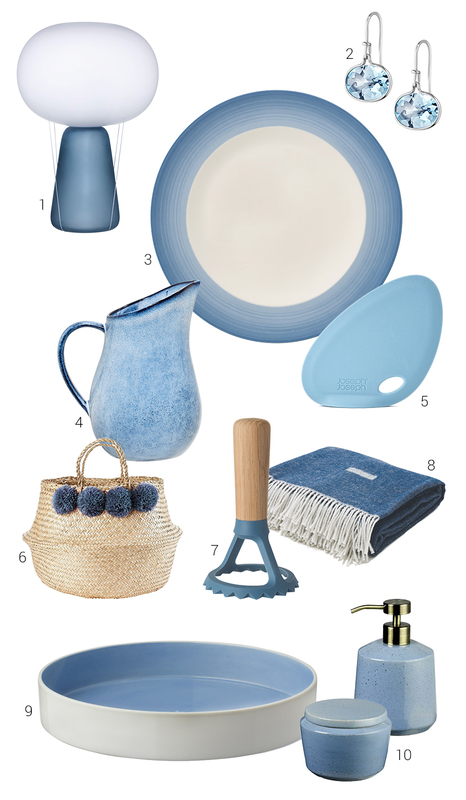 A gentle way of launching into the blue is to set out blue crockery for a summer meal outdoors or snuggle down in the blue twilight wearing a soft woollen blanket and watch the stars come out. It’s the colour equivalent of being in the movie musical “La La Land” – a feeling of freedom and weightlessness. Soon you’ll be wanting to introduce more of this light blue to the whole house, since it provides a relaxed sense of lightness and fits all different styles of decoration. It’s interesting how a basic blue can be endlessly reinvented, in nature as elsewhere, without losing its fundamental positivity. Kitchen aids in new shades of blue will help you keep cool while cooking, and these purist earrings with beautifully cut topaz really are a thing of beauty. If summer whites are too soft a partner for you, simply combine Pantone blue with strong, radiant and dark shades. Blue, green and a pinch of yellow make everything bright and beautiful. But can these three work together without clashing? 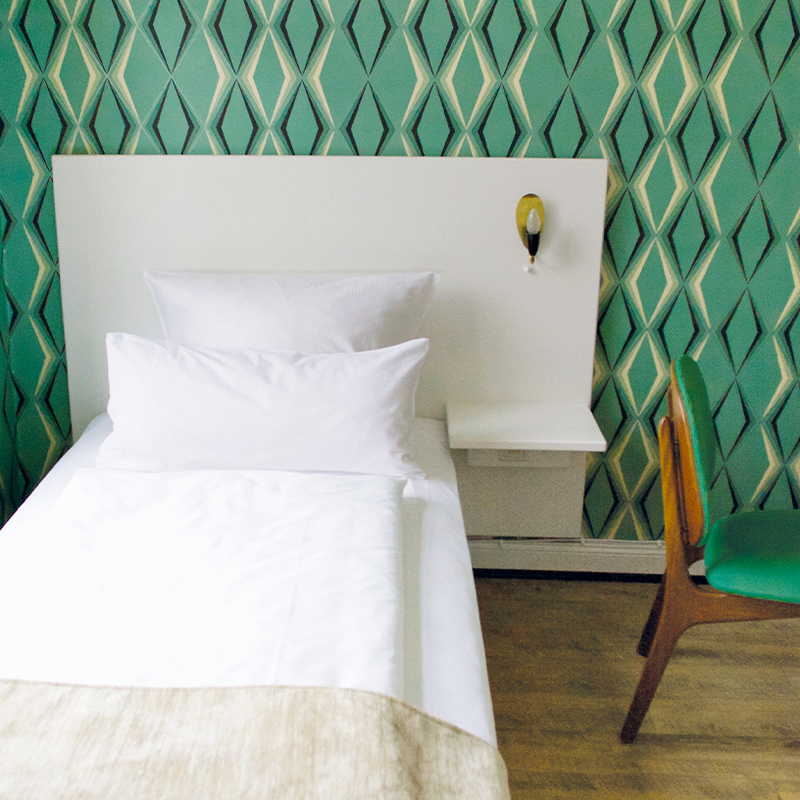 ‘Fritz im Pyjama’ is a cute boutique hotel in Hamburg’s Schanzenviertel. It’s the place to go if you want to see these on-trend colours living under the same roof. This art deco building has 17 rooms, each decorated in different individual styles. 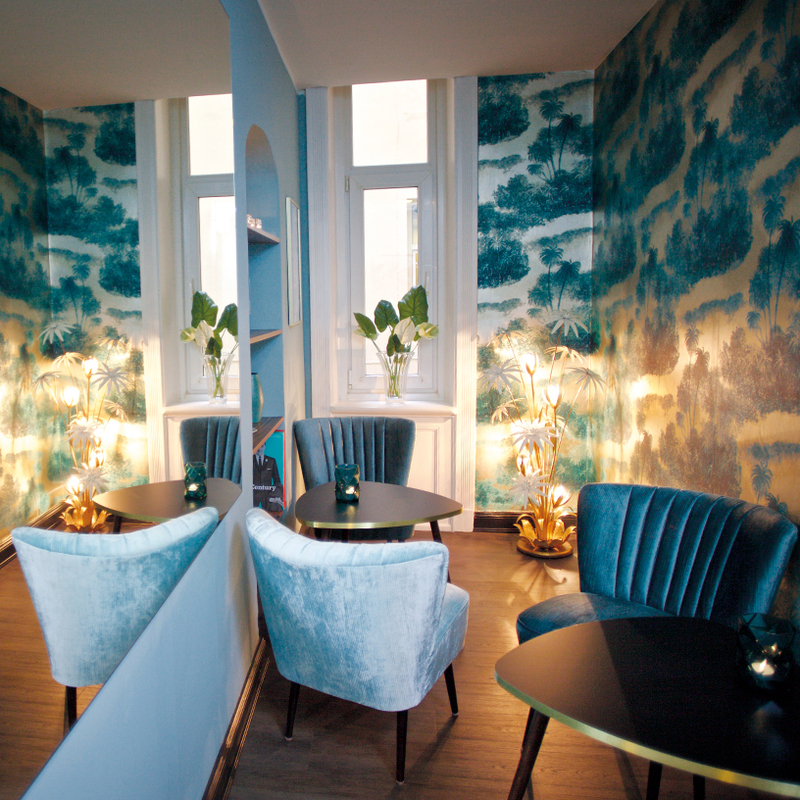 Every room sends a different message, reflected in its eclectic furnishings and atmosphere. Blue or black-and-yellow patterned wallpaper meets design classics and custom furniture in rooms studded with green and sky-blue accessories. This gives a fresh, cosy feel you’d normally get within your own four walls. We give this freshly-minted style icon the thumbs up.